I am pleased to join you today for the Greater China Restructuring Forum. My thanks to COINS – the Company and Insolvency Law Society – for organising this timely gathering of high-profile experts from all over the world. Today's forum is part of the International Financial Week here, and underscores Hong Kong's role as one of the world's leading financial centres. It puts a deserved spotlight on our restructuring practice, and the myriad opportunities that such practice presents. This forum, and its organiser, also reflect the diversity and dexterity of our financial sector. Hong Kong is a global capital formation centre, renowned for attracting businesses and investors from all over the world, providing them with world-class financial and professional services, essential connections and the means to excel. As the world's largest offshore Renminbi business hub, and Asia's major asset management centre, Hong Kong is the central connector between the Mainland of China and the rest of the world. That singular role also gives us unparalleled advantages in serving the investment and financing needs of the Belt and Road Initiative. Belt and Road companies can raise capital and seek financing in Hong Kong through IPOs (initial public offerings), post-listing arrangements, bond issuance, bank loans and many other means. As the world economy becomes more integrated, cross-border transactions have also soared. This has led to increasing demand for financial services in Hong Kong. A well-structured corporate insolvency regime can only boost Hong Kong's competitive edge as a global financial centre, attracting companies from all over the world. We are fully committed to realising that advantage. In 2016, we modernised the Companies (Winding Up and Miscellaneous Provisions) Ordinance through a series of legislative amendments, enhancing our protection for creditors and streamlining the winding up process. We are now working to introduce a statutory corporate rescue procedure for Hong Kong. The proposed corporate rescue procedure will help financially strapped companies revive their businesses. A key objective of the proposed procedure is maximising the viability of a company or, if this is not possible, achieving a better return for the creditors of the company than is the case now with an immediate insolvent winding-up. We are drafting the proposed law. In the process, we have referred to comparable regimes in the United Kingdom and Australia. The law's key features will include the following: largely out-of-court arrangements to save time and costs; the presence of a moratorium under which legal proceedings will be stayed; a defined time frame for specified actions to speed up the determination of a company's fate; and a phased payment schedule for outstanding employee entitlements. Let me add that the legislative exercise is both technically complex and politically controversial. In fact, this will be our third legislative attempt to introduce a corporate rescue procedure in Hong Kong. Challenges notwithstanding, we are charging ahead. Our target is to introduce a bill into the Legislative Council this legislative year. In parallel, we are examining the issue of cross-border insolvency. In recent years, cases of cross-border insolvency have become increasingly common. At the moment, Hong Kong has no domestic legislation on cross-border insolvency, which means that winding-up proceedings would have to be introduced in each jurisdiction. This, of course, is expensive and time consuming. More recently, Hong Kong courts have resorted to the common law to assist foreign liquidators. With that in mind, we plan to introduce domestic cross-border insolvency legislation, applying an international co-operation framework. One option is adopting the United Nations Commission on International Trade Law's "Model Law on Cross-Border Insolvency," with suitable modifications to protect local creditors. Insolvency and restructuring services often require a stable financial market, providing the required liquidity to businesses in an efficient manner. Our world-class financial infrastructure and deep liquidity make Hong Kong an ideal centre for insolvency and restructuring deals. These advantages also make us an attractive option in raising capital for Belt and Road projects and companies in the Greater Bay Area ready to go global. To that end, the Government has taken steps to create a conducive environment for such companies. The Hong Kong Monetary Authority has set up an Infrastructure Financing Facilitation Office, which works with a cluster of partner stakeholders to help enable infrastructure investments and their financing. To date, 95 organisations from the Mainland, Hong Kong and overseas have joined the Office as partners. They include multilateral financial agencies and development banks, public-sector and private-sector investors, asset managers, banks, insurance companies, pension funds, infrastructure-project developers and operators, professional service firms and international business councils. In short, the response to the Office has been wide ranging and enthusiastic. In addition, the Securities and Futures Commission issued a statement last year, explaining the factors it takes into account in reviewing the proposed listing of infrastructure project companies in Hong Kong. By doing so, the Commission has clarified the pathway for infrastructure project companies to seek listing here. On IPOs, last year we implemented a new listing regime, enabling companies from the emerging and innovative sectors to list on the Stock Exchange of Hong Kong. The Government has also introduced initiatives to promote Hong Kong's bond market and green finance, including launching a Pilot Bond Grant Scheme, a Green Finance Certification Scheme, and offering enhanced tax concessions to encourage investor participation in the bond market. The launch, in recent years, of the Stock Connects and Bond Connect, as well as the mutual recognition of funds arrangement, are all strong testimony to Hong Kong's unique role in the internationalisation of the Renminbi and as the gateway between international markets and investors and their counterparts on the Mainland. The introduction of a statutory corporate rescue procedure and cross-border insolvency legislation will build on this foundation, boosting our status as an international financial centre and China's international financial capital. 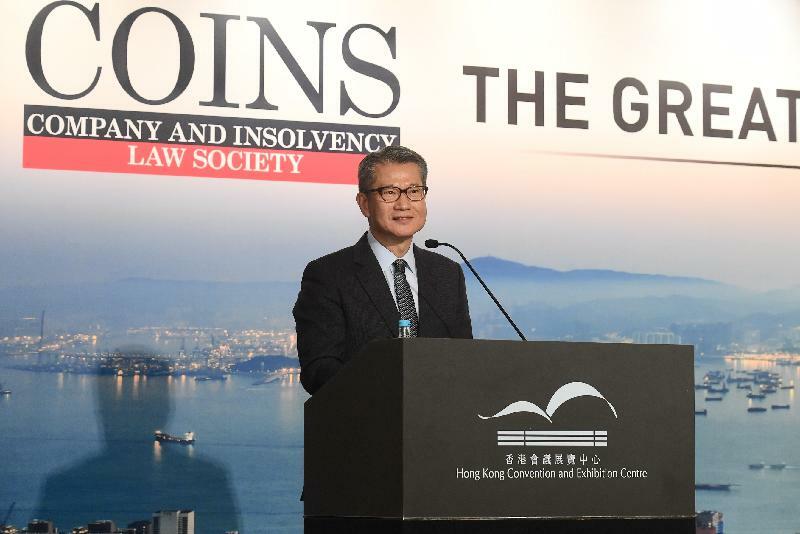 My thanks, once again, to COINS and our financial and legal professionals, for promoting Hong Kong as a centre for international debt restructuring and providing access to the Mainland's debt market. The legal profession, let me emphasise, plays an essential role in attracting Mainland and overseas companies to Hong Kong, because rule of law underpinned by an independent judiciary is fundamental to their confidence in us. Here, they gain peace of mind, knowing that contracts are enforced, disputes are equitably settled and intellectual property rights are well protected. Ladies and gentlemen, I am confident that, with your continuing support and considered input, Hong Kong will soon be recognised, internationally, for its insolvency and restructuring expertise and services. I wish you all a rewarding forum and a happy, healthy and solvent New Year.